The promise is simple: deliver a customized washroom experience to everyone. Designed for everyone. Built for you. An innovative step in our continued fiber leadership in North America. The Choice is Yours. It's as Simple as that. MOD* Dispenser Systems are designed to be what you want, when you want it, wherever you want it. Innovative internal dispensing modules plug and play to give you the flexibility to build a paper towel dispenser customized to meet your requirements. Today, and tomorrow. So as your needs change, your MOD* Dispenser System changes with them. All without the hassle of taking down one machine and installing another. Packed with Innovation. And Towels. The MOD* Dispenser System delivers one of the highest capacity towels around and includes a stub roll feature that reduces waste and cost. 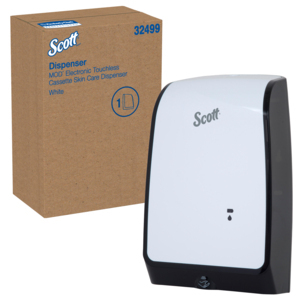 So whether it's 1,150 feet of SCOTT® Brand hard roll towels or 700 feet of KLEENEX® Brand hard roll towels, that means fewer change outs and more satisfied users. The MOD* System is also packed with power. The NG-Series "power assist" setting offers the longest battery life - 4 times longer than the enMotion® dispenser. NG-Series: Designed to deliver a better experience and consumption control for customers in office buildings and high-traffic facilities. The patent-pending SMART CONTROL* Dispensing Technology features two delivery options -precut and power-assist. Towel delay settings not only control usage, but allow for faster or slower dispensing depending on the restroom traffic needs. The NG-Series is the next generation in touchless automatic dispensing, offering the longest battery life in the industry. E-Series: Electronic Automatic motion-activated dispensing with the option for an unexposed sheet, making it ideal for healthcare facilities. M-Series: Controlled manual delivery offers the hygiene of touchless automatic dispensing without the batteries. The MOD* Dispenser System gives your building a clean, modern look while increasing your productivity. Loaded with innovation, this modular system uses high capacity 1,150 foot towel rolls for fewer change outs and more satisfied users. Its NG-Series module delivers pre-cut and power-assist delivery options for controlled usage, offers the longest battery life in the industry, and a better user experience. 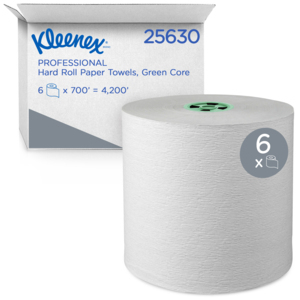 The dispenser's stub roll feature reduces waste for more sustainable and cost-effective performance. They Say Image is Everything. We Say Performance Helps, Too. The MOD* Dispenser System is sleek. It's hip. It's very now and very wow. Its modern design is matched with modular flexibility. It also combines touchless automatic technology with the bacteria-reducing benefits of drying with paper towels. The MOD* Dispenser System is quieter than enMotion® and Tork Intuition systems. And it features a versatile skin care dispenser designed to take hand hygiene to another level. It's why the MOD* System isn't just cool, it also captures The Healthy Workplace Project* commitment to promote better hygiene. Better for Your Business. And the Planet. KLEENEX® Brand and SCOTT® Brand paper towels are Forest Stewardship Council® (FSC) and EcoLogo®-certified and meet the EPA standards for minimum post consumer waste content. KLEENEX® Brand paper towels contain 20% bamboo, making them the first towel in the N.A. market to contain non-tree fiber. KLEENEX® Brand and SCOTT® Brand paper towels are designed with patented ABSORBENCY POCKETS*, so users need fewer towels to dry their hands. The result: more towels left in the dispenser, more time between refills, less paper waste and, in many cases, less cost for your business.